How to survive as a mum in business. Being a mum in business; a survival guide. Just over a year ago, I gave birth to my first baby: my creative agency, Dream & Do. In a couple of months, I’ll be having my first real-life baby and, to be perfectly honest, I’m starting to wonder how it’s going to work managing the two of them together. Listening to Emma Isaacs from Business Chicks speak about business and motherhood at 9 to Thrive last year was definitely inspiring; we really can “have it all” and there are plenty of role models out there killing it. But now that the due date is looming, I’m having trouble bridging the gap between dream and reality. Supermum, business mother, “mummypreneur” … whatever you want to call them, they’re on the rise. According to a report by Dell’s Global Entrepreneurship and Development Index, Australia is the second greatest country for female entrepreneurs. In today’s globalised, digital world – not to mention the apparent “age of the entrepreneur” – it seems that new mums have freedom like never before, to pursue their interests, passions and exercise those creative and business minds, with a child on their hip. But how on earth do they make it work? Does maternity leave exist when you’re the founder and creative director of a start-up? Tara Shelton. Image courtesy of Prue Aja. I’ve built a wonderful little team in the last year, who are more than capable of running the show while I focus on being a new mum for a couple of months. I’m not worried, they’re not worried, but a few clients have expressed concern that I’ll be taking a bit of maternity leave. When meeting new clients in the last few months, I’ve (ashamedly) found myself dressing differently and trying to hide the fact that I’m pregnant, particularly in front of men. There’s an undeniable stigma still associated with being a business owner expecting a baby; I’m worried they will think I’m not dedicated or reliable. Funnily enough, the clients who have spoken out are women - other mums in business - which really took me aback. Shouldn’t we all be supporting each other? A lot of people say that running your own business as a parent affords the freedom you don’t have when you’re working for someone else, but what about the financial pressures of stepping back and having a person or team replace you while you’re away? Furthermore, there’s talk of work-life balance being a moot point in this day and age. 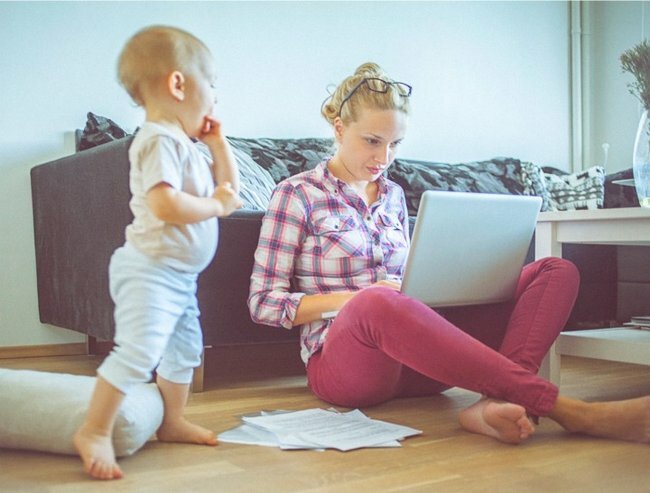 With so many entrepreneurs, creatives and freelancers following unconventional career paths, particularly in the online world, when do working mums switch off from work and onto family life? They say the quickest way to success is to look at those who’ve done it and lived to tell the tale, so I’ve reached out to some of our clients and other mums who run their own thriving businesses. If you’re also an expecting or new mum and an entrepreneur, I hope these nuggets of wisdom help allay your fears too. 1. “Stop resenting the situation and find an alternative.” - Jennifer Anson from Girls Getaways. 2. “Just be in the moment.” - Collette Dinnigan, iconic Australian fashion designer. It’s safe to say that mums in business don’t always get the luxury of “time off” or work-life balance. You just do the work when you can, in between feeding, school drop-offs, homework and bedtime scheduling. I saw Collette Dinnigan speak at an event in Sydney last year, and she slayed the idea of balance in favour of being in the moment. 3. “Don’t beat yourself up.” - Emma Isaacs, CEO of Business Chicks. 4. “Give yourself a reality check … there are only 24 hours in the day.” - Lisa Morley, Ms Peacock Fine Chocolates. 5. “It’s really important to remember who you are.” - Emma Thomson, Mums Empowered. One of my biggest fears has been that my business won’t matter to me anymore after holding my baby for the first time; that everything else will fade. But Emma Isaacs has reassured me - in her recent interview for the Mamamia podcast ‘I Don’t Know How She Does It!’ it’s the primal, protective instincts that kick in to make those with a true entrepreneurial spirit even more ambitious. I think I’m ready to tackle this journey head-on! Are you a business owner? How do you balance work and family? Dream & Do is a Sydney-based creative agency specialising in branding, graphic design and creative content for start-ups, business visionaries and dreamers everywhere. Tara is hosting a special edition of Cereal Mummypreneurs at Sydney’s QVB Tea Rooms on Tuesday 8 March 7-8.30am. Tickets available here.